This simple but profound process has unlimited possibilities for application to various fields of endeavor and communities of people. See the many ways people are using Touch Drawing. As a therapist, body worker, or healer, you can keep materials in your office for use by your clients at appropriate times. Touch Drawing is a way to move beyond conditioned patterns and allow subconscious images to emerge. It can be used to either catalyze or integrate an experience. The drawings can then be reflected upon for further insight. Touch Drawing taps into mythic levels of the psyche. Touch Drawing can be particularly powerful for people dealing with body-based trauma, such as sexual abuse. In Touch Drawing, the body can speak directly for itself. Touch Drawing makes visual expression available to people who are unable to hold tools, such as those with Parkinsons, arthritis, or are rehabilitating from a stroke. There are potential applications for work with autistic children, learning disabled, the blind and deaf. Touch Drawing can be used in conjunction with numerous therapeutic and personal growth forms, such as Voice Dialogue, Guided Imagery and Music, Psycho synthesis, Expressive Arts Therapy and Dreamwork. Art Therapists find it to be a particularly appropriate and direct medium in their work with visual expression. Children find Touch Drawing to be magical and fun. Touch Drawing can be a powerful expressive tool for women in moontime, pregnancy and labor, as well as those who are in the process of dying. It can also help families to be present to their grief. It is a wonderful family activity that each member can experience at their own level, in a broad range of emotional climates. 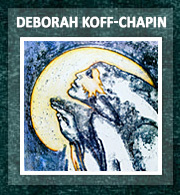 Selections from Birth Series by Deborah Koff-Chapin. Each was created during a contraction. 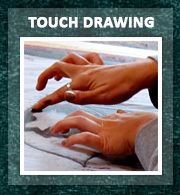 Among friends, Touch Drawing is a way to share intimately without having to talk. A small group can meet regularly to draw, and reflect on each other’s images and how they relate to their lives. Inviting a friend over to draw when they need emotional support can be a meaningful and transformative way to offer help. Touch Drawing provides a non-verbal way to integrate a lecture, concert or poetry reading. If you draw the images that come to you while listening, you may find you are able to concentrate on a deeper level than usual, and recall the content and feeling/tone of the presentation when reflecting on your drawings at a later time. As an artistic form, Touch Drawing allows for the exploration of deep interior imagery. The spontaneity of the process allows for creative blocks to be dissolved, and authentic imagery to pour forth. Images that emerge in Touch Drawing can then be elaborated upon and refined in other artistic mediums. 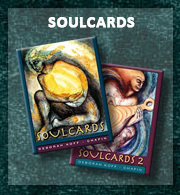 It can also be used as a complement to other expressive forms such as dance, creative writing or ritual. Touch Drawing can be a gratifying way to spend time out of doors and connect with the underlying spirit in all life. 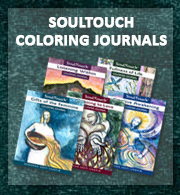 Touch drawing is a vehicle for creative, psychological and spiritual integration. If you feel a spark of inspiration about how to apply Touch Drawing in your own life and work, by all means fan the flames! And let us know what you are doing, so we can share your experiences with others. In this way you will be contributing to the evolution of a new expressive form. The Center for Touch Drawing needs you! Send ideas and insights to center@touchdrawing.com.